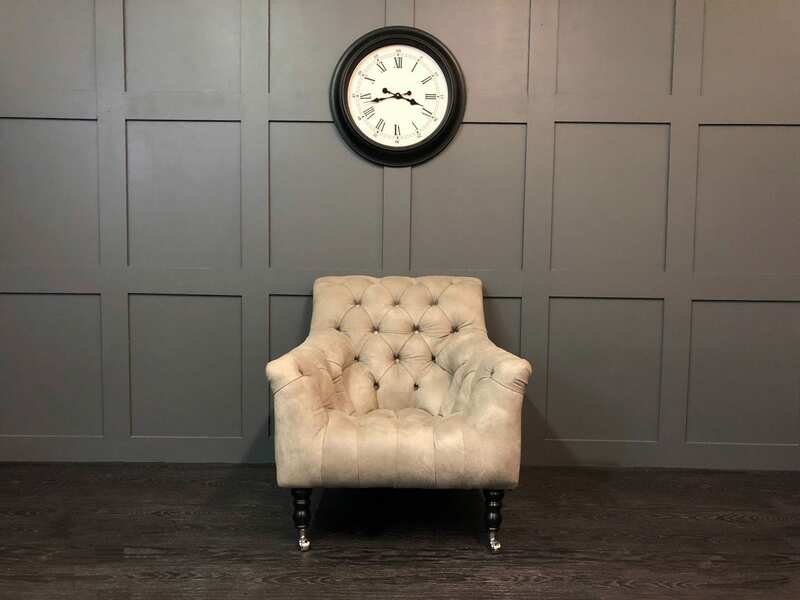 The Chelsea Arm Chair is a newcomer to our Statement range and is something which we are really excited about here at Timeless Sofas. 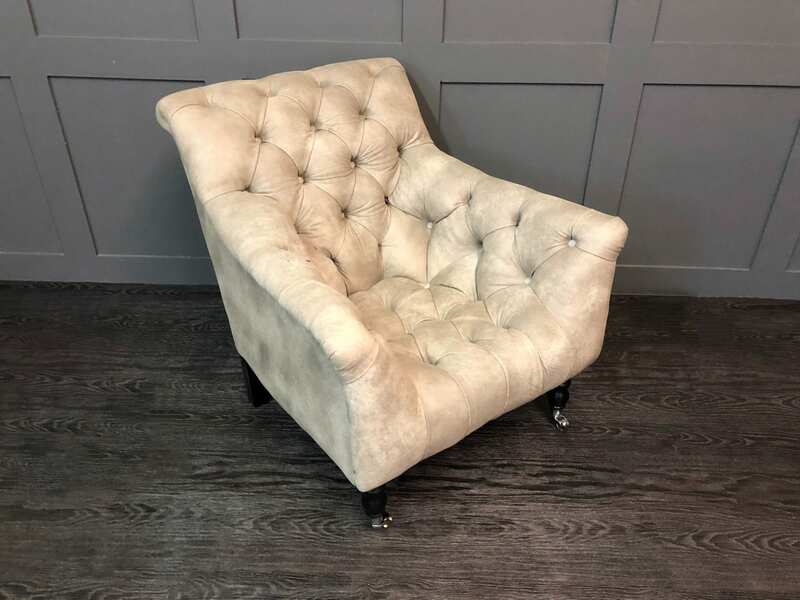 A modern take on a traditional chesterfield tub chair, The Chelsea arm chair features a virtually seamless seat which gives a unique and stylish shape. Pair this with its deep hand buttoning, single studding and chrome castors, and you achieve the perfect blend of classic and contemporary. 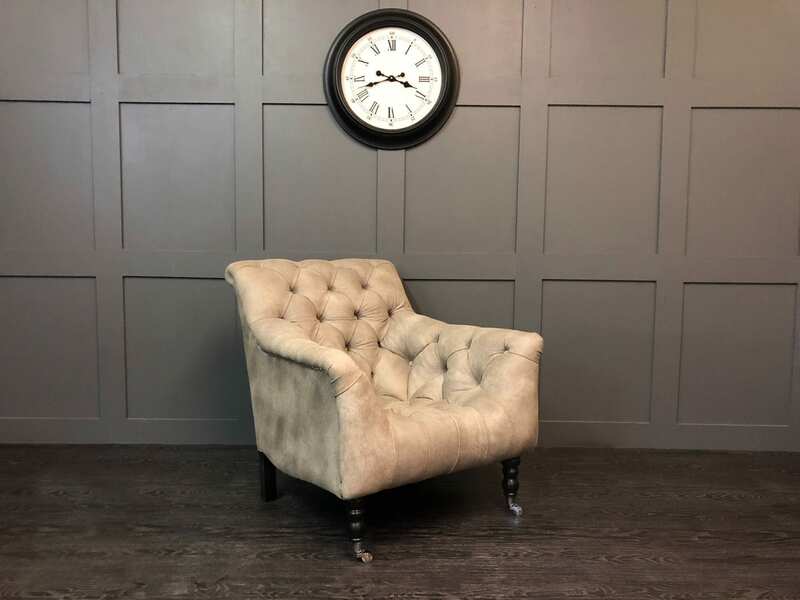 This chair is pictured in ‘Sand’ Rustic leather. 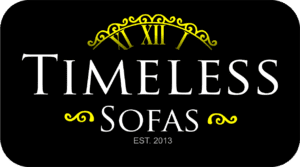 All of our furniture is hand-crafted by our team of highly skilled, time served upholsterers in Greater Manchester, England. This sofa can be handmade to order in a large variety of high quality velvets and Italian leathers with a great selection of colour choices. To view our full range of velvets and request your FREE swatches, please click here. 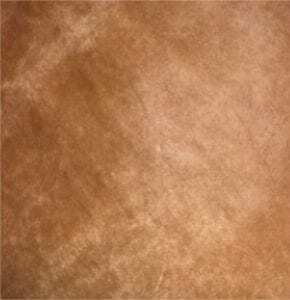 To view our full range of leathers and request your FREE swatches, please click here. Please note that the leather colour may vary slightly from the images shown. To ensure that the colour is right, we would strongly advise that you request a free swatch before placing your order. If you would like to talk to one of our sales advisers before placing your order, please feel free to contact us on 0161 870 9150. We use only the highest quality Fabrics and Italian leathers. 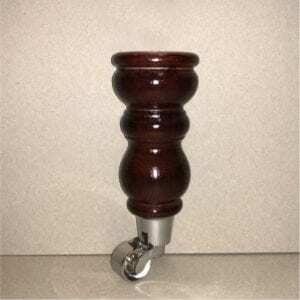 (which exceeds the EU Fire Retardant Regulations). We Spring inside back and seat, For more information, please feel free to Contact Us. 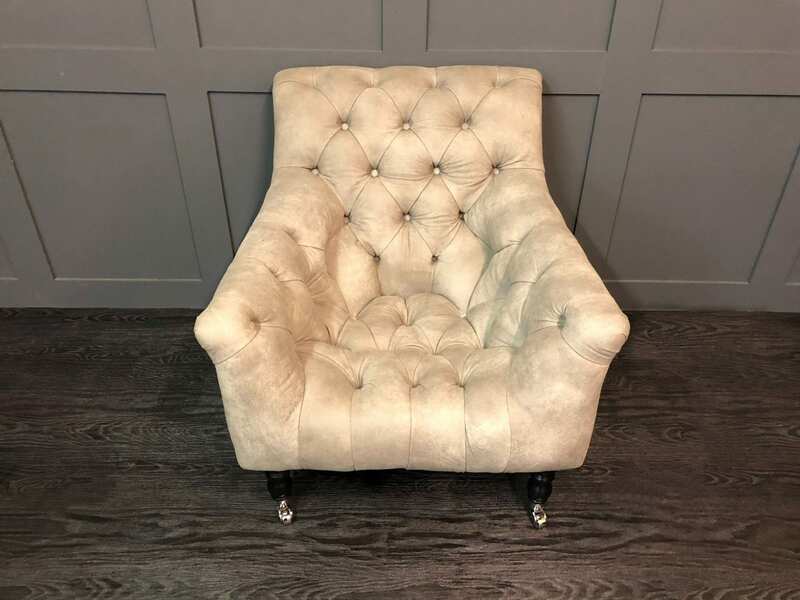 The Chelsea Arm Chair is one of our newest and most popular chairs from the Statement range. 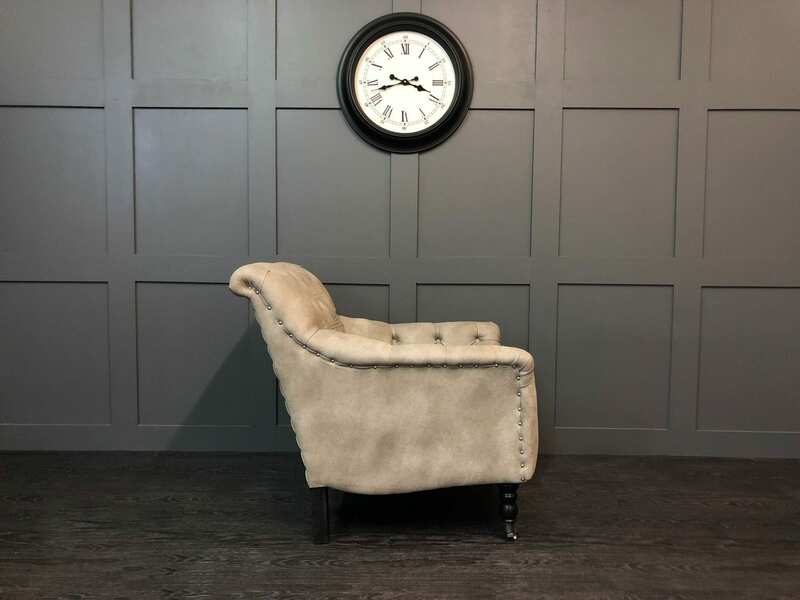 It is our own contemporary take on a classic chesterfield tub chair and is something which we are very proud of. It has a deep hand buttoned seat which merges seamlessly into its low back and arms. We have added castors on the front feed and single studs every two inches on its sides to give it a timeless finish. To view our full range of velvets and request your FREE swatches, click here. To view our full range of leathers and request your FREE swatches, click here.